East Africa’s Great Lakes Region has ever since been a melting pot for dozens of different population groups from what are today several countries. Within this dynamic region, the Kivu provinces in the Democratic Republic of the Congo (DRC) staged the most vibrant migration movements, mostly as a result of force from national or regional conflicts respectively. During the Twentieth Century several kinds of migration movements which were for their part characteristic for the region of the Kivus can be distinguished. An initial wave of forced labor migration in the Kivus was pushed under Belgian colonial rule. For their vast plantation activities and the rubber harvest the administration was in need of many workers. As the then sparsely populated Kivus the Belgians simply could not fit their demand. Consequently, labor force was recruited from other regions of what was then known as Belgian Congo as well as from neighboring territories. After World War I, today’s Rwanda and Burundi became integral part of the Belgian Congo administration under a League of Nations’ mandate. Vast numbers of workers from the territory of today’s Rwanda were moved to the neighboring Kivu regions in order to cope with the scarcity of labor force on plantations and in the mineral rich mines. Secondly, internal conflicts among the populations particularly in Rwanda and Burundi moved thousands of people to the Kivu regions and even to neighboring Tanganyika which was to become today’s (mainland) Tanzania. One of such outbreaks of violence which lead into thousands of Rwandans fleeing their country was the Hutu rebellion at the end of the 1950ies shortly before the country officially gained independence. Following violent clashes in later decades, even more people were forced to head westwards. In the years before Rwanda’s devastating 1994 genocide, the invasion of the Rwandan Patriotic Front (RPF) from Uganda shook the country’s population once more and saw thousands of people leaving their homes. In the aftermath of the genocide itself, the world witnessed probably one of the largest and fastest migration movements ever. The UNHCR reported of approximately 1.2 million refugees crossing the border to the DRC which was by then still Zaire. During the Rwandan invasion in the refugee camps on North and South Kivu at the end of the 1990s another phase of migration movement occurred. 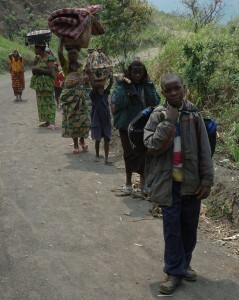 People were forced to move back to their home regions in Rwanda. With that, then rebel leader and today Rwandan head of state, Paul Kagame and his strategists intended to eliminate a living threat that also found shelter in the camps: Among the hundreds of thousands of refugees there were also thousands of génocidaires, with them the whole military corps of the Hutu extremists. In the camps these forces prepared the recapture of Rwanda and terrorized not only refugees but also the local population. With their launch of repatriation programs, Rwandan authorities forced a counter-migration upon the refugees which brought thousands of Rwandans back to their home country. 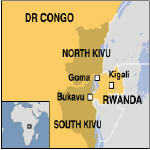 Today, Kagame is again seen to play an important role in the Kivus’ recent conflict. Finally, Africa’s so-called World War brought even larger country overlapping migration movements with it. All these different forms of migration have in common that they caused enormous problems within the regions that people were brought to. Under the pressure from outside, often enough the local population was internally displaced. This forced displacement is one other very common form of migration which cannot only be observed in the Great Lakes Region but anywhere in the world where people are forced to leave their homes within their home country, may it be caused by violent conflicts or natural disasters. The same is true for labor movements which can also cause tremendous difficulties in other societies and lead into even more migration movements. After all, migration movements are a very striking phenomenon in the Twentieth and Twenty First Century. Not only did they create even more complex social compositions and potential tensions among the world’s societies.